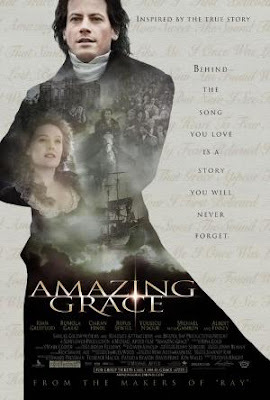 Continue reading after the jump to access my original review of "Amazing Grace." Amazing Grace is about rights activist William Wilberforce’s struggle to end the slave trade in England at a time when most found slavery acceptable, and those who didn’t agree with it refused to speak against it. Wilberforce, a brilliant public speaker, decided to use his sway in Parliament to pass a bill banning the slave trade, and for years he tried to get it passed. His main inspiration came from an old priest who used to be captain of a slave ship, and has since renounced the slave trade and tried to repent for his sins. Veteran actor Albert Finney plays this priest, and does an astounding job. He makes you feel all the guilt and pain his character is going through, which is on of the most important parts of the film because his character is the one that wrote the song “Amazing Grace,” where the film gets it title. The song, sung frequently in the film by characters, is about him “seeing the light” and deciding to reject slavery. This makes his performance probably the most important in the film, and he does a phenomenal job that is nothing short of acting perfection. The rest of the acting is good, and while no one matches Finney’s level of performance, most of the actor’s come close, and the acting is, on the whole, a well rounded job. Standout performances are those by Michael Gambon, (well known for playing Albus Dumbledore in the later Harry Potter films,) playing a parliament official who joins Wilberforce, and Ioan Gruffudd, who plays Wilberforce himself. Gruffudd does a very competent job, and carries the film nicely. His performance isn’t phenomenal, but it is very, very good. I never would have expected it from him, thinking about his last performance as Mr. Fantastic in the atrocious film adaptation of Fantastic Four, which was a less than stellar piece of acting. But Gruffudd proves he does historical drama best (he was also good as Lancelot in the 2004 film “King Arthur”) and I hope he sticks to this kind of film. The only problems with this otherwise well rounded film is that the pacing is off in some scenes due to a very simple and unenergetic editing job. The cuts are too quick, and some scenes go on a little too long. A better editor would have a made this an even more enjoyable experience then it already is, but it is only a small complaint. Also, the dialogue early in the film is rather cheesy, but does smooth out as the film goes along. I would recommend this film for anyone over 12 years of age. It is an important piece of history, and a very powerful, profound film that is not to be missed, but its content might be over the heads of younger viewers.